It is the intention of our Society that our annual volumes shall contain a complete record of all the important facts relating to the organization. Many of these facts cannot well be included in the formal report of proceedings, and, therefore, it is necessary that each yearly volume shall contain a supplementary article similar to this. The origin and objects of the Society, and its history up to . the time of their publication, were included in our first and second volumes. It is unnecessary, therefore, that this sketch should deal with those subjects. The report of the Executive Committee for the year ending with our Louisville Congress contains a general review of our progress during the period which it covers. From this report, it will be seen that our executive plans have been reduced to a satisfactory system, and that our advancement has been very gratifying in every respect. It will also be seen why Louisville was chosen as the place for holding our third Congress in preference to San Francisco, Charlotte, or Atlanta—all of which sent us pressing invitations. Louisville is about the center of our membership, and, indeed, of the whole Scotch-Irish population of this country. In Kentucky, as in Tennessee and Pennsylvania, the Scotch-Irish constitute the most numerous and influential part of the population. Daniel Boone, the first explorer and settler of the State, and the people who followed him to Central Kentucky, were from the Scotch-Irish settlements of North Carolina. The great body of the immigration which poured into the State during the years immediately following this original settlement were of the same stock. Living as the race did, on the western frontiers of the original States, from Pennsylvania to Georgia, it was natural that they should constitute the first wave of population which overflowed the Alleghanies and poured into the fertile lands of the Mississippi Valley. The course of this immigration was mainly on east and west lines. The great body of Tennessee's first settlers were from North Carolina; those of Kentucky were most largely drawn from Virginia. Being the first coiners and the boldest, hardiest of all pioneers, it was natural, also, that they should take possession of the fairest portions of the land. They were the people, moreover, above all others to retain what they had acquired; and their descendants to this day hold the vantage-ground which the courage and enterprise of their fathers gained for them. The men of this race have been the leading spirits at every stage of the State's history. This fact was never more strikingly manifest than now. No State in the Union has more distinguished statesmen and orators, and they are Scotch-Irish almost to a man. Among them are Carlisle, Blackburn, Breckenridge, Knott, Watterson, Lindsay, Buckner, and McKenzie. What is true of her public men is equally true of her private citizens. The leading element in every business and profession is of this stock. They constitute the predominant element in Louisville, as in other parts of the State. 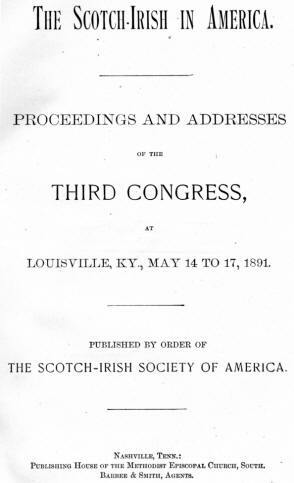 The invitation to hold our Third Congress in Louisville was extended in the name of the city by her representative bodies, the Scotch-Irish Society of Kentucky, the Board of Trade, and the Commercial Club. All the arrangements for our entertainment were of the most generous character. What these arrangements were in detail may be seen by reference to the report of our Executive Committee, to which allusion has already been made. Suffice it to say here, that they were similar in character to the provisions made for our entertainment at Columbia and Pittsburg. As first organized, the local Executive Committee consisted of Gen. James A. Eakin, Chairman; Mr. Helm Bruce, Secretary; Maj. Clinton McClarty, representing the Scotch-Irish Society of Kentucky; and Messrs. P. N. Clark and John S. Morris, representing the Commercial Club and Board of Trade respectively. After the death of General Eakin, whose loss is profoundly felt, Maj. McClarty, President of the Louisville Clearing House, was made Chairman of the committee. Other comitteemen, whose names appear in another part of this volume, were afterward appointed. To all of them the thanks of our Society are due, but to Maj. McClarty and Mr. Bruce we owe a special debt of gratitude. Maj. McClarty was especially active on the Finance Committee, and largely through his efforts a handsome fund was raised for defraying the expenses of the occasion. Mr. Bruce had upon him the burden of nearly all the details of management. The amount of time and work necessary to the successful discharge of such duties can only be realized by those who have actually performed them. Notwithstanding the demands of a very extensive law practice, Mr. Bruce found time to carry every detail to completion. Mr. James Ross Todd, Chairman of the Reception Committee, and Captain J. B. Briggs, who was largely instrumental in drawing the Congress to Louisville, are also especially entitled to the high appreciation which we feel for their active efforts in providing for the entertainment of visitors. Executive Office, Frankfort, April 19, 1891. To the Public. By invitation of the Board of Trade, Commercial Club, and citizens of Louisville, the Scotch-Irish Congress will convene in that city on the 14th day of May of the present year. This meeting will ho of peculiar interest to Kentuckians, with whose early history the heroic actions of this sturdy race are so closely interwoven; and the citizens of the State will deem it a privilege to welcome to this Congress the representatives of this illustrious race from all parts of America. No political or sectarian significance attaches to this assemblage. Its mission will be to revive memories of the American Ulster race, and to collect materials for compiling a history showing its impress on modern civilization, and especially on American institutions. Executive Mansion, Nashville, Tenn, April 11, 1801. 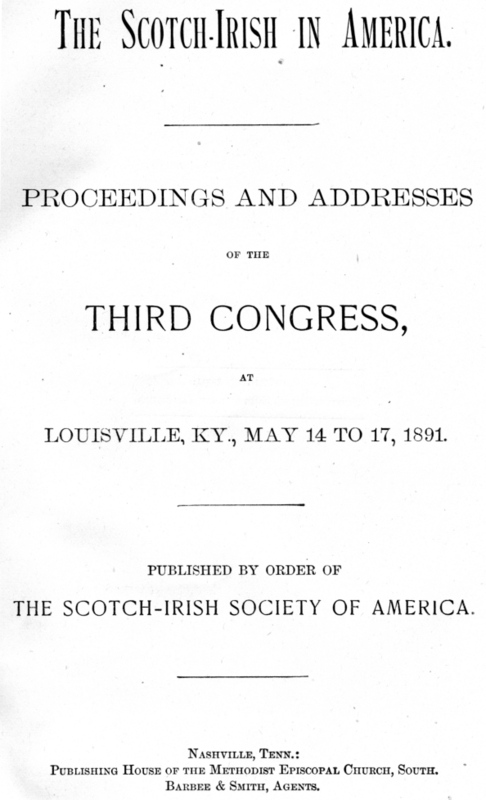 The Scotch-Irish Association of America will hold its third annual Congress at Louisville, Ky., on the 11th day of May next. Tennessee gave birth to this Association, the objects and purposes of which are so worthy, being, among other things, to impress upon the pages of history the heroic deeds of the sons of the Scotch-Irish race. By this race Tennessee was conquered from savage men and beasts. Tens of thousands of Tennesseans to-day have this blood in their veins. Her illustrious citizens, Andrew Jackson, James K. Polk, James Robinson, Samuel Houston, David Crockett, and numerous other of her historic citizens were of this race. Hence Tennessee should be well represented in this Congress. I therefore request that Tennessee sons of this blood, wherever they may be, attend this Congress, and thereby honor the heroes, statesmen, and patriots of a race whose deeds and fame have given prestige to our State and shed glory upon the page of our national history. Governor Buchanan, of Tennessee, has issued a proclamation calling the attention of the people of that State to the coming meeting of the Congress of the Scotch-Irish Societies of America, at Louisville, Ky., May 14-17, 1891. In his announcement he sets forth that Tennessee owes much—in fact, every thing—to this blood for her renown. He names Andrew Jackson, James K. Polk, Sam Houston, and Davy Crockett as representatives of the blood who gave to the State her eminence, all of which calls to mind the fact that Ohio is rich in Scotch-Irish blood. Had it not been for the daring and skill at arms of George Rogers Clarke, who was sent to the Ohio country during the Revolutionary War by Patrick Henry, also of the intrepid blood, and who wrested the north-west territory from the British, it is quite likely that the southern boundary of Canada would be the Ohio River instead of Lake Erie. Ohio is indebted to the greatest Scotch-Irishman of them all, Thomas Jefferson, for the articles of cession by the State of Virginia to the Federal Government, in which it was provided that there should be no slavery in the territory after the year 1800, the first emancipation proclamation in America. Not only this, but our first Governor, Arthur St. Clair, was of this blood. And how great is our indebtedness to the memory of such men as General Anthony Wayne, Colonel Johnson, and Simon Kenton, whose bravery made Ohio a possible haven of peace for the pioneer! . . . Not only this. There is no line of action worthy of honorable human endeavor that has not been followed by the Ohio Scotch-Irishman. To-day he fills nearly all the offices in the State-house. He is on the bench, at the bar, at the head of colleges and schools, in the pulpit, and his hand is at the helm of that great moral engine, the press. The Scotch-Irish of Ohio have a record equal to the Scotch-Irish of Tennessee or Kentucky. The object of the Association is the laudable one of preserving American history (for all Scotch-Irishmen are true Americans, and their blood stained the battle-fields of both the first and second war for independence. They were with Scott and Taylor in Mexico; with Sam Houston in Texas; with Jackson in Florida; with Grant and Sherman, with Lee and Jackson in the late war between the States. And this calls to mind that the second object of the Society is to bring together in good fellowship the men of the North and the South. James A. Campbell, Governor of Ohio. Owing to our increased numbers and influence, the prestige coming from the success of our former gatherings, and the more extensive press notices both in America and in foreign countries, the interest in this Congress was more wide-spread and the attendance of representative people of the race larger than on any former occasion. Unfortunately, several other public gatherings, whose dates had not been decided on when ours was fixed, were held in Louisville at the same time our Congress was in session. For this reason the city was very much crowded, and many visitors could not secure such hotel accommodations as they desired. This gave the people of Louisville an opportunity to display the hospitality for which they are so celebrated. All who would accept their hospitality were generously accommodated at private residences, and the difficulty was thus, in a large measure, happily overcome. The crowded condition of the city, made known through the daily press, kept away many who otherwise would have attended, especially people living in territory accessible to Louisville by a few hours' travel. The morning sessions of the Congress were held in the Masonic Temple Theater, and the evening meetings at the Polytechnic Hall. Both of them are large and comfortable auditoriums, situated near the center of the city. The order of the exercises and the proceedings, including the addresses of the occasion, will be seen in the following pages. The eloquence of their delivery was equal to their literary merit, which will appear from a perusal of them. The programme was interspersed with splendid music, furnished by the Rogers Cornet Band, of Goshen, Ind., which has no superior in the rendition of popular music, especially Scotch and Irish airs, to which they have devoted particular attention. Mr. Charles E. Rogers, leader of the band, had composed especially for the occasion "The Scotch-Irish March," dedicated to Col. T. T. Wright, originator of our Society. It was called for by the audience time and again, and always elicited the most enthusiastic applause. On the first evening of the occasion, after the regular exercises of the Congress were over, a reception was given at the Galt House by the Scotch-Irish people of Louisville to the members of our Society and other visitors attending the Congress. For several hours the spacious parlors and halls of this great hotel presented a scene of rare social distinction and enjoyment. Such an array of noted men and accomplished women is seldom witnessed; nor was the appearance of the company less noticeable than its distinction. The strikingly large number of stalwart men and handsome women shows that the race still retains its physical as well as mental and moral superiority. Elegant refreshments were served to the guests, and delightful music lent its charms to the occasion. The acquaintanceships formed at this reception brought visitors, at the beginning, into pleasant social relations among each other and with 'the people of Louisville, thus rendering the remainder of their stay in the city in the highest degree enjoyable. This was, however, but the beginning of social attentions paid us by our generous hosts. They threw open their houses, their clubs, and places of public entertainment, and took their guests to the various points of interest in and around the city. The Louisville Hotel was official head-quarters, and here were gathered all the Scotch - Irish visitors who could secure accommodations. Through these various means our people were brought into closest and friendliest contact. The result here was, as it has elsewhere been, not only social pleasure of the highest order, but the establishment of strong personal friendships between representative people from different parts of our country, which are peculiarly effective in obliterating sectional prejudices. A dozen distinguished, public-sentiment-making men will do more toward drawing the people of their common country together in bonds of true sympathy than a host of uninfluential persons. The effect becomes enhanced if they represent various pursuits, and come together for the purpose of stimulating broad-minded patriotism, and not as the members of some sect or party, seeking to advance some particular doctrine or interest. Some societies have a greater number of members than we, and others as many distinguished men; but no one of them, perhaps, brings together so many leading molders of public sentiment from every section, and from so many fields of thought and activity. Because of these reasons, and the patriotic character of our his^ torical work, our Society is performing a unique office in pro^ rooting good feeling among the different sections of our country, and in intensifying a love of American institutions. The exercises of the Congress proper closed on Saturday night, May 16, but the local committee had arranged for religious exercises on the Sabbath. By previous invitation, visiting ministers occupied the various pulpits of the city in the morning, and at night there was a grand religious mass-meeting at the Auditorium. This great building, holding about four thousand people, was packed to its utmost capacity, and thousands more were turned away for the want of room. The service was conducted after the old-time Covenanter fashion. Rev. Dr. Samuel Hamilton, who had been chosen to preside, was too unwell to do so, and his place was filled by Rev. Dr. Hemphill. Rev. 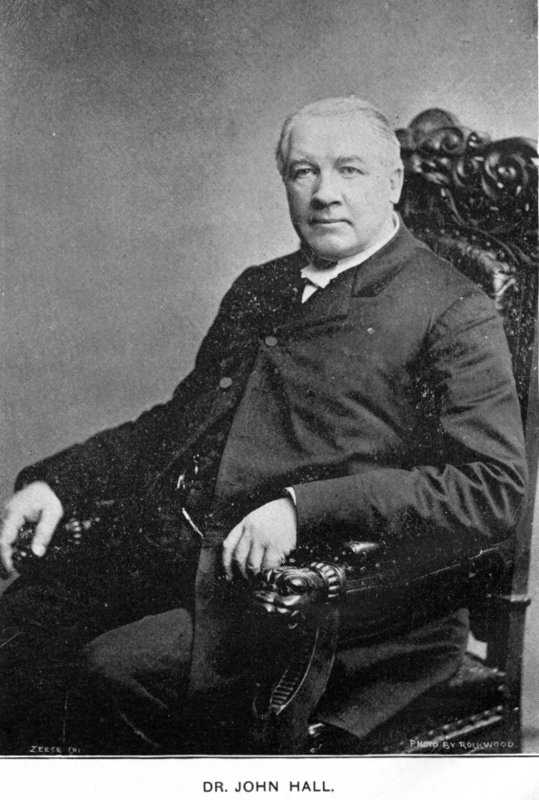 Dr. John Hall, of New York, preached the sermon of the occasion. Only psalms were sung, and they were given out line by line. The Scripture lessons read were explained by passages. The service was new to many of the younger generation, but it carried hundreds of the older people back to the customs of former years, and revived in them affecting memories. All the assembled thousands joined in the singing, which was grand beyond description. A spirit of deep devotion seemed to pervade the great audience as they listened to the impressive Scripture lessons, the earnest prayers, and the eloquent sermon, characterized by the power of thought, yet grand simplicity of language which distinguishes the great preacher. Being composed of a race distinguished for its devout spirit, our Society, though entirely non-sectarian, is thoroughly religious in character. A great religious service, therefore, is a fit climax for our annual gatherings. Our people left Louisville with a deep sense of appreciation for the splendid hospitality of their entertainers, and warm, fraternal feelings toward each other. All were gratified with the success of the occasion, and more than ever determined to use every effort to advance the interests of our Society. We enter a new Society year with auspicious prospects for the continued success which we confidently hope will be realized. Louisville's Greeting to Erin's Sons. The Scotch-Irish of the Bench and Bar. By Prof. George Macloskie, of Princeton, N. J.
Scotch-Irish influence upon the Formation of the Government of the United States. By Rev. J. H. Bryson, D.D., of Huntsville, Ala. The Scotch-Irish Race Among the Nations. By Rev. Dr. Thomas Murphy, of Philadelphia, Pa.
By Mr. Terence Masterson, of San Francisco, Cal. The Scotch-Irish in East Tennessee. By Judge Oliver P. Temple, of Knoxville, Tenn.
By Judge William Lindsay, of Frankfort, Ky.
By Rev. Stuart Acheson, A.M., of Toronto. By Rev. John S. Macintosh, D.D., of Philadelphia, Pa.
A poem by Mrs. Kate Brownlee Sherwood, of Canton, O. The Scotch-Irish in the General Synod of the Reformed Presbyterian Church of North America. By Rev. David Steele, D.D., Philadelphia, Pa. The Scotch-Irish of South-Western Pennsylvania. By Mr. S. T. Wiley. Religious Services and Closing Exercises at the Louisville Auditorium - Dr. John Hall's Sermon. W. J. Frierson, Oakland, Cal. Born Jan 8, 1810; died Oct. 21, 1890, Aged 80 years, 9m 13d. Matthew T. Scott, Bloomington, Ill.